ATLANTA – Loving people is very hard at times. I love my family dearly, but it can be very difficult. We are called to love people with the hope that they will change. But, if I am honest with myself, sometimes I love people to change them. When people don’t change, I sometimes grow frustrated. I’m forced to wrestle with my own brokenness as I attempt to love them in the best possible ways. I discover that I have unspoken expectations for people and how they will change. “Skeptics are the ones who have turned their ideals into expectations.” That sentence – that wisdom –hit me like a ton of bricks when I read it in school. Ministry can be dangerous and addictive. I remember my first ministry position, as a youth pastor. When I began, we had a very small gathering. It was not long before I was dreaming about what our group could become, and then I started to “idealize” about it. After I had perfected my ideals, I began to build my expectations about the group. Amazingly, those ideals and expectations turned into reality. The youth group grew, and kept expanding. This success – this surge – fed something dangerous in my soul. Subsequently, when the church went through some very challenging things and the youth group started to decrease in numbers, I grew depressed. I questioned what I was doing wrong – what was wrong with me. It was only after Christ called me out of ministry and to Himself that I started to examine the core of my interior life, and in that journey, I confronted the baggage I carried: I was addicted to change in people through ministry. In counseling terms, I was extremely co-dependent. Upon digging further into my soul, the Spirit revealed to me that when my internal life was chaotic, I tried to control the people around me and to manage the events unfolding in my life. Because I had not properly understood God’s grace and love and truly accepted those blessings on my own, I sought to exert control over the people to whom I ministered. My selfishness boiled down to this: I needed people to change so that I could feel better about myself. A friend told me recently that God calls us to be faithful “to” people and not “for” people. The “for” in our attempts to love people puts expectations and parameters on our love. The “to” loves freely and without expectations. I am not called by God to change or redeem anyone. Instead, I am called to love in the best ways possible. I am called to be as faithful and to listen as well as I can to those I seek to serve. I am slowly learning to release the change to God. God is the author of change, not me. This realization – this truth – makes it easier for me to love my neighbor, to be truly joyful in ministry, because I’m not going to change a thing. Sometimes it’s incredibly hard and downright difficult at times for me to live out this truth. But when I do, a deep and abiding joy sweeps over me, in the midst of it all. 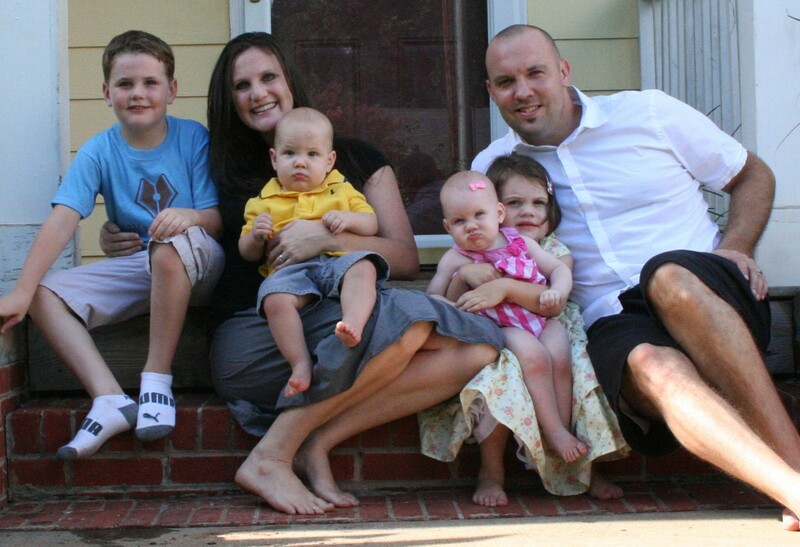 Dan Crain and his family in Atlanta. Dan Crain is a liaison/trainer for Polis Institute. He and his wife Adrienne and their family live in South Atlanta. He can be reached at dan@polisinstitute.org. Consider signing up for Dignity Serves, a six-week course that helps you rethink the way we serve others in our community. It teaches you to see problems differently and respond in a way that empowers those you serve rather than just meeting their immediate needs. ATLANTA – There are many people in our culture who do not have the same opportunities and platforms to speak that others enjoy. Yet God has given goodness and talents to everyone. I love it when people who often times are “overlooked” by the world help mold and shape me as a person. For example, some ministry leaders with whom I serve often talk about how frustrating it can be when people from outside our neighborhood visit and express such alarm when they discover goodness or rich talents among the our neighbors who live here. They are downright surprised. I suspect people have their eyes opened because too often many of us are not willing to listen. Think about how many times people return from mission trips and say that they “received” so much more than they “gave.” Maybe the consistency of such revelations takes root because too many people are not willing to listen. They see the world only for what they can give, and not how other people can serve them with their unique talents. One young man I am mentoring has taught me much about poverty and the realities of our neighborhood. Recently, he commented that the talents of people who live at or below the poverty level fail to be noticed. Their gifts are looked over. This is why I believe so strongly in asset-based ministry. We serve, expecting only to uncover what God is already doing in forgotten people and neglected places – and we strive to empower them. The vision of Polis is such that, “We believe that well-being will improve only when the talents of the poor are properly engaged.” When you improve the well being of people on the margins, whole cities improve. Unfortunately, some churches are stuck in a groove – a mind-set – that more “charity” will improve the well being of the poor. The truth is, most people who live in poverty don’t want more shoes, more clothes, more food, or to have their rent paid. They yearn for opportunities for their talents to be engaged. They need respect. 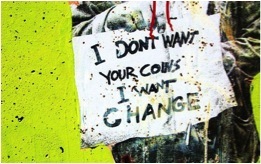 As one sign says, “I don’t want your coins, I want change.” No one likes to be a charity case. Why do we expect anything different among the poor? Do we really love our neighbors as ourselves by just giving things to them? Loving our neighbor as ourselves requires much more than charity. It involves relationships that typically get dirty very quickly. What if those who hold the power and resources and are in the position to help, served in such a way that did not look over the talents of the poor? Dan and Adrienne Crain and their family. Since this photo, they’ve been blessed by the arrival of twins, Eden Violet Alliene and Isaac Levi Keith. Dan Crain is a liaison/trainer in South Atlanta for Polis Institute. He can be reached at dan@polisinstitute.org. ATLANTA – So I have been on this urban ministry journey for about 2½ years now – not long, but time enough to observe interesting things and to experience moments of pure joy, not to mention complete bewilderment and frustration. I find it discouraging when people into whose lives I pour myself make bad decisions. Or they don’t show up for meetings. Or they don’t seem to care. I wrestle with myself, asking: Why are we doing this? Does what God has called us into make any difference? I find that when we attach ourselves to change, we quickly burn out. This was my experience during four years of youth ministry life. People would “change” – for example, decide to follow Jesus – and I would get excited and hopeful. Eventually they would return to their old habits, addictions and behaviors, and I would be discouraged. My identity was attached to the changes they had made in their lives. This indicated a tendency on my part to be codependent. I found myself deriving meaning and purpose from the change in people. There are beautiful moments that inspire joy. For example, our house is strategically located on a corner where lots of people walk by. We are often in our back yard, playing baseball with our kids. Not long ago, my son Landon hit a ball over the fence, into the street. Upon retrieving it, I ran into a neighbor I have been getting to know. Todd and I stopped to talk. He proceeded to tell me how much he enjoys watching us play as a family. Our backyard ball games make him long for his family back in Charleston, S.C. He reminisced of going to the beach, of deep-sea fishing, of the job he had with his family. He expressed his desire to return home. As we stood in the street, the wind gently blew at our backs. I considered it a reminder from God that His spirit is constantly moving. As Todd and I continued chatting, one of the young adults in the neighborhood stopped by the house to drop off a reference letter for the summer camp our church puts on. He has incredible potential but has been wrestling with direction in life. Attending the camp is a good next step for him, as it is a great avenue for training young leaders. Before Todd and I parted ways, we prayed for one another. We were in agreement that we are not here to “save” people, and that we probably need more “saving” than most people do. It was in this moment we realized “this is not why we do what we do.” We do not love people or develop friendships because we want them to change. Any change is up to God. Instead, we do what we do because God has called us to be faithful in the small things, to be good neighbors. We are called to show up again and again and again. God is the author of change, not us. God cares more about changing this world and redeeming all things far more than I ever will. Living with this awareness allows me to hold change very loosely. ATLANTA — I find it much easier to talk about someone else’s brokenness than my own. Perhaps this is why it is so tempting to watch shows like Moury Povich or TMZ. We like to observe the ugliness of others. Why? It helps us escape ourselves, our own ugliness. When we avoid self-examination and focus on the faults of others, it helps fill that emptiness inside our souls that was meant to be filled only with the love and affection of God, and His insistence that we are His beloved. In other words, everyone needs to change except me. Does our friend need to change? Yes. Do I need to change? Yes. Pointing out the brokenness in others ignores this fact. I see this manifest itself even in our two children, who are 4 and 2. As my wife and I prepare for the addition of twins, we have tried putting Landon and Karis to sleep in the same bedroom. One night Landon told us that Karis enticed him want to play with his toys, as she disobediently decided to get out of bed and play. Look at the story of the woman caught in adultery. Her accusers brought this woman before Jesus to point out her sin, her brokenness. So how should we respond to the shortcomings of others, to their brokenness? We should extend the same love, grace, forgiveness, kindness, mercy and faithfulness that God gives to us. We are broken people for whom God has forgiven much. When we realize this, we can look at ourselves in a mirror and ask: Who really needs to change? 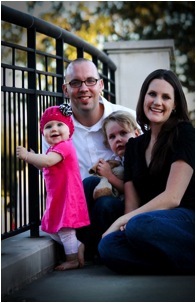 Dan Crain and his family.